When I aim my camera at the window of my living room, the light appears to overwhelm the camera and I cannot see anything outside the window--it is a total whiteout. With a normal camera I would close the aperture but there is no way to do that with this camera, is there? The light coming through is not really bright, either... it is just a normal outside view to the north. 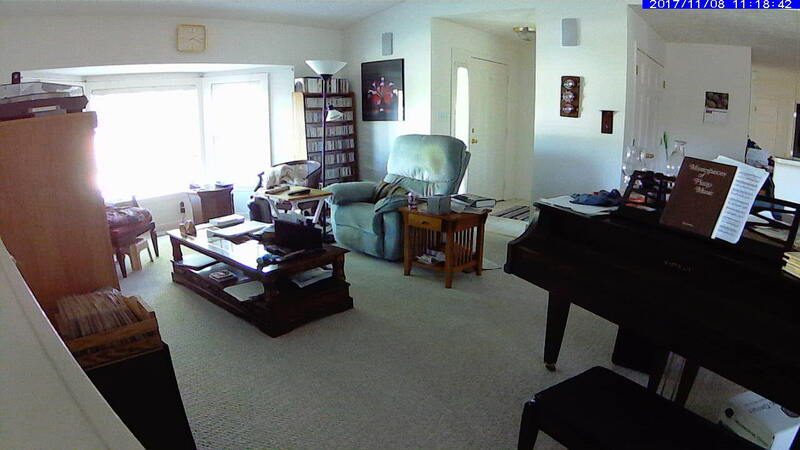 The rest of the room looks good... does this camera have a fixed aperture? Probably a stupid question. Unfortunately you cannot turn off the IR LEDs so pointing out a window at night will get that nice white spotlight. If there is any light outside lock the camera to day mode, otherwise try black electrical tape but it is impossible to block 100% of the LED. EDIT - Actually are you talking about in general day time viewing or at night? Well, I'm talking about day mode, here, so there IR isn't operating, right? Does this happen all day or at certain times? Well, I would assume it would get a little better in the evening near dusk. It is normal daylight out (in Indy). I will attempt to add an image to this message. Hmm, I don't know how to do that I'll have to figure that out. I see there is an Insert Image button, but I don't know how to put my jpeg between the tags. It is a fixed aperture. Log into the web UI > setup > image setup and disable anti-flicker, and play with the brightness/saturation settings. Is the light reflecting off the window from internal lighting or is it bright outside? To add an image, enter the URL (must be on 3rd party site), highlight it and click the Insert Image button (above the emojis, below the B). Yeah, I've played with the brightness settings, etc. It doesn't help. This is light from the outside, not reflected light from inside. The camera is positioned about 15 feet from the window and looking out at an angle to my front yard. There is a tree right there and it is not bright, but the light washes out the whole of the windows (there are 3). The rest of the room living room looks fine. I need to find a site I can upload a picture to. Well, I took a picture with my camera which has the outside looking ok and the rest of the room is pretty much in darkness. I guess that means the difference in brightness is just too great. If the aperture is fixed then the camera cannot average the brightness about the room, so I guess we're just stuck with it. I know disabling the anti-flicker has helped a few customers with bright spot issues. Let me forward to a tech and see if they have any advice or settings that could help. By default anti-flicker is disabled. I upgraded the firmware. Now it is sometimes asking for authentication where it didn't before... and it is not consistent. It is asking for it when I try to view .avi files off of the SD card. Is there anyway I can go back to the previous firmware?? I have placed the older version of the firmware back on my camera and the weird behavior continues, which seems to mean that the F/W upgrade is not what caused this anomaly. The weird behavior is that changing the day in which a .avi is located causes the camera to issue a security dialog asking for the password. I give it the password and check "Remember my credentials". Then the next file I try to read does the same thing... gives me the dialog and the password wasn't remembered, so I have to enter it again. I'm wondering what the heck is causing this behavior. As far as I know, I haven't made any browser changes, so what could be causing this behavior? Also, I want to point out that it didn't do this prior to the firmware upgrade. Any help? I now have one camera on version 1.03.06 and a different camera on the new firmware 1.04.10. Both of them are exhibiting the same issue.